One of the greatest advantages of staying in a villa is the personalised service provided by dedicated staff. Villa Cendrawasih’s staff have been professionally trained and will do their utmost to please with their warm and friendly Balinese hospitality. Villa Cendrawasih’s friendly manager is responsible for overall operations. His job is to oversee and coordinate the staff and property and to assist guests during their stay. The villa’s skilled private chef will happily prepare anything from the Western, Asian, vegetarian and children’s a la carte menus, as well as discuss special requests and dietary requirements. Four attendants look after daily housekeeping and domestic duties. A gardener maintains Villa Cendrawasih’s lush gardens and swimming pool. A driver and car (seating up to seven passengers) is available to villa guests for eight hours a day at a special rate (on guest account). Night-time security provided from 11pm until 7am. Villa Cendrawasih’s chef is at your service to prepare daily breakfast, lunch and dinner. The villa offers an extensive suggestion menu of delicious meals featuring Asian and Western dishes to cater to all tastes, including an excellent selection of vegetarian and children’s options. Our chef previously worked at La Lucciola – one of Bali’s most celebrated Italian restaurants - and cooks up excellent pasta dishes, and is equally adept at blending an aromatic Thai curry and making traditional Balinese desserts such as dadar– pancakes filled with coconut and palm sugar. He can also grill up a feast of fresh seafood on the barbecue, prepare decadent set menus and poolside snacks and tailor meals to accommodate any special dietary requirements or specific requests. Villa Cendrawasih is a great villa for families with children, who will love the lawns and swimming pool and easy access to the beach (make sure to always swim between the flags as currents can be strong). Those with toddlers may wish to request the instillation of a pool fence (charges apply). Although the equipped kitchen allows you to prepare meals for fussy eaters or babies with ease, staff will happily to do this for you – just talk through your requirements and meal schedules with the villa manager or chef and they will take care of the rest. Pancakes by the pool for breakfast? Chicken nuggets for tea? No problem. The chef can customise all meals to suit children’s taste buds. Don’t worry about packing all that cumbersome kids’ equipment for your stay. Just let us know what you need, and anything we don’t have in-house (villa facilities include a baby cot, highchair and kids movies) we can hire on your behalf (click here to see list of available hire items). 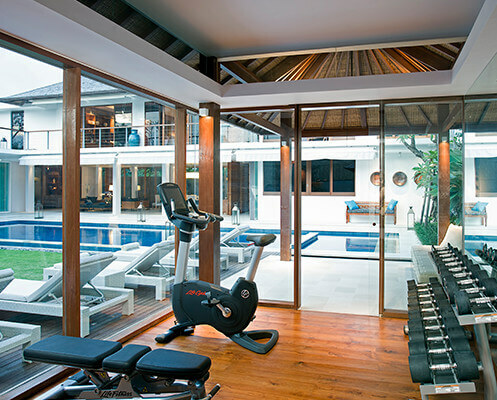 Fitness fanatics will love the air conditioned gym and the chance to work out on state-of-the-art equipment while enjoying lush garden views. Fitted with a good selection of professional Life Fitness equipment, including bench with extensive array of weights, exercise bike, treadmill and step platform. Yoga mats, wall-mounted TV and bathroom are also included for your convenience. An outdoor terrace has a cushioned day bed. Release built up tension with a traditional Balinese massage by the pool or in the privacy of your room. 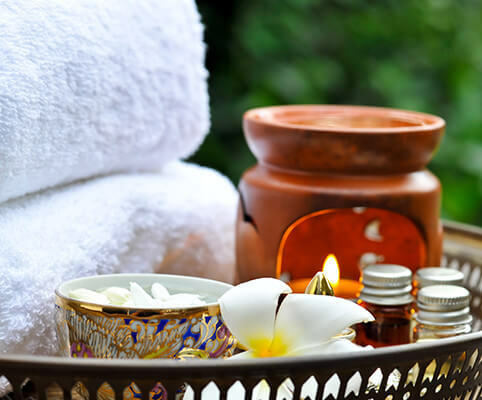 Using a combination of gentle stretches, acupressure and aromatherapy oils to stimulate the flow of blood, oxygen and energy around your body, you will feel totally relaxed in no time.